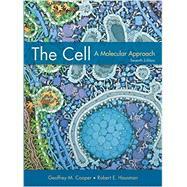 by Cooper, Geoffrey M.; Hausman, Robert E.
Teaching cell biology can be a daunting task because the field is so vast and rapidly moving, characterized by a continual explosion of new information. The challenge is how to teach students the fundamental concepts without becoming bogged down in details. Students need to understand the principles of cell biology and be able to appreciate new advances, rather than just memorizing "the facts" as we see them today. At the same time, the material must be presented in sufficient depth to thoughtfully engage students and provide a sound basis for further studies. The Cell, Seventh Edition, provides a balance of concepts and details that meets the needs of today's students and their teachers. Written by an active scientist and experienced educator, this textbook combines readability and cohesiveness with comprehensive and up-to-date science. - Is ideally suited in length and complexity for sophomore- and junior-level courses at the undergraduate level. - Can be covered in a single semester. Students can master the material in its entirety, rather than sampling a small fraction from a much larger text. - Is written in an efficient and compact style, covering a broad range of material in a direct and pedagogically approachable manner. - Focuses on the molecular biology of cells as a unifying theme, with topics such as developmental biology, the nervous system, the immune system, and plant biology being discussed as examples of more general principles. - Features "Key Experiment" and "Molecular Medicine" boxes that highlight the experimental nature of molecular and cellular biology and convey the excitement and medical relevance of research in this area. * NEW! Videos: A new collection of online videos (referenced throughout the book) helps students visualize complex cellular and molecular structures and processes. * Online Quizzes: Two sets of online quiz questions are available for each chapter, both of which are assignable by the instructor. - Multiple-choice quizzes test comprehension of the chapter's key material. - Free-response questions ask students to apply what they have learned from the chapter. * Animations: Narrated animations help students better grasp key complex topics and processes. * Micrographs: Interactive versions of the many micrographs in the book, illustrating cellular structure. * Flashcards & Key Terms: A great way for students to learn and review the key terminology introduced in each chapter. * NEW! Data Analysis Problems: New for the seventh edition, this set of over seventy problems presents students with real-world analysis exercises. Each problem is built around figures and data from specific published papers, and students are challenged to interpret the figures, analyze data, and explain methods and results. Complete answers and explanations are provided. Ideal for use as in-class exercises or as homework assignments. Revised and updated for the seventh edition, the Test File includes a collection of over 1,300 multiple-choice, fill-in-the-blank, true/false, and short-answer questions covering the full range of content in every chapter. New for the Seventh Edition, all questions are referenced to Bloom's Taxonomy, making it easier for instructors to select the specific types of questions they want when building an assessment. The entire test file plus all of the online quiz questions are provided in Blackboard's Diploma software. Diploma makes it easy to assemble quizzes and exams from any combination of publisher-provided questions and instructor-created questions. In addition, quizzes and exams can be exported to many different course management systems, such as Blackboard and Moodle. The Cell's Companion Website features pre-built chapter quizzes (see above) that report into an online gradebook. Adopting instructors have access to these quizzes and can choose to either assign them or let students use them for review. (Instructors must register in order for their students to be able to take the quizzes.) Instructors also have the ability to add their own questions and create their own quizzes. Geoffrey M. Cooper is Professor of Biology and Associate Dean of the Faculty for Natural Sciences at Boston University. Receiving a Ph.D. in Biochemistry from the University of Miami in 1973, he pursued postdoctoral work with Howard Temin at the University of Wisconsin, where he developed gene transfer assays to characterize the proviral DNAs of Rous sarcoma virus and related retroviruses. He then joined the faculty of Dana-Farber Cancer Institute and Harvard Medical School in 1975, where he pioneered the discovery of oncogenes in human cancers. Since moving to Boston University as Chair of Biology in 1998, Dr. Cooper has used The Cell in teaching undergraduate cell biology, as well as continuing his research on the roles of oncogene proteins in the signaling pathways that regulate cell proliferation and programmed cell death. He has authored two textbooks on cancer and published over 100 research papers in the field of cell signaling and cancer research. Robert E. Hausman was a Professor in the Department of Biology at Boston University. Receiving a Ph.D. in Biological Science from Northwestern University in 1971, he pursued postdoctoral work with Aron Moscona at the University of Chicago, where he investigated cell-cell interactions during early embryonic development. Dr. Hausman joined the faculty of Boston University in 1978, extending his investigations of cell surface interactions to muscle and nervous system development. He taught undergraduate cell biology with Dr. Cooper and contributed to several chapters of previous editions of The Cell.